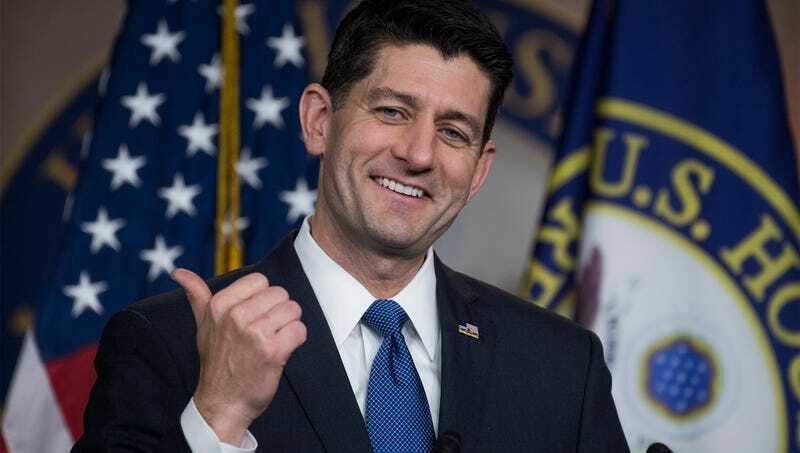 WASHINGTON—Saying the current disapproval would soon give way to support, House Speaker Paul Ryan was confident Thursday that the American people will warm up to the new tax plan once they realize life is a cruel and meaningless farce. “Although it may not be very popular now, I’m certain that Americans will come around to this new system when they begin to understand the ruthless absurdity of existence,” said Ryan, explaining that once taxpayers see that there is no objective moral framework in the unforgiving chaos of the universe, they will learn to appreciate what this bill actually does. “I think many voters will find a lot in this tax overhaul that they can embrace when it finally dawns on them that they have no agency and it’s futile to resist entropy. We just need to keep hammering home to average folks that our time here on Earth is a joke with no punchline.” At press time, Ryan said that once Americans accepted the brutality and pointlessness of life, they’d be just as amenable to gutting Medicare.